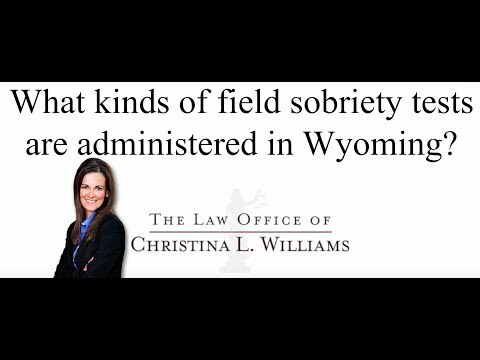 What kind of field sobriety tests are administered in Wyoming? In Wyoming, law enforcement will administer a handful of field sobriety tests. Some of them are standardized and some of them not. The standardized field sobriety tests are the tests that the officers are trained at the academy to give in a very standard, specific manner. The instructions are standardized and what they look for for evidence is standardized. Those include the horizontal gaze nystagmus test, or the eye test, and the walk and turn, and the one legged stand. Those three must be given properly or they can’t be used against you as evidence or the evidence can be questioned. The other tests that the officers will generally use are the backwards count starting at 100, ending at 87. Again they are looking to see if you can follow the instructions and the alphabet, starting with the letter C, ending with the letter O. Those are just examples of what they may ask you to do. There is also the Romberg. The Romberg test is just test where they are observing your movement and your ability to follow instructions. Again, you don’t ever have to do any of the field sobriety tests, but that does not mean that the officer will not arrest you for DUI.